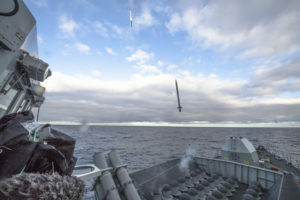 The Royal Navy has successfully conducted the final First of Class firing trials of the new Sea Ceptor air defence system – completing the qualification firings of this cutting-edge new capability for the Royal Navy. With HMS Argyll having completed development testing of Sea Ceptor, the weapon system is now being rolled out to the Royal Navy’s other Type 23 Frigates. The first of a series of installation test firings has been successfully completed on HMS Westminster. Each Sea Ceptor platform will similarly complete an installation test firing in due course as they prepare to re-join frontline service after their refits. Sea Ceptor offers a step-change in capability compared with legacy systems like Seawolf, which it is replacing in Royal Navy service. While Seawolf gave Royal Navy warships the capability to protect themselves, with Sea Ceptor the navy’s frigates will now also be able protect other vessels. Speaking following the success of the trials, Nick Neale, Sea Ceptor Programme Manager at MBDA said: “The performance and capabilities of Sea Ceptor have been fully demonstrated in these outstanding trials by the Royal Navy. Recognising the complexity of the new system, the consistent level of success achieved is quite remarkable and testament to the quality of MBDA’s verification and validation process”. As part of the Portfolio system of co-operation between the UK Ministry of Defence and MBDA, CAMM is also being brought into service as the weapon element of the Land Ceptor system to replace the British Army’s Rapier ground-based air defence systems. By operating a common missile, the UK armed forces will be able to take advantage of significant cost benefits throughout the lifecycle of the systems, including development, procurement, support costs and sharing a completely common stockpile.